She has a studio in Cottenham in the Cambridgeshire Fens. Her landscapes have a strong geometric structure of contrasting colours and textures. 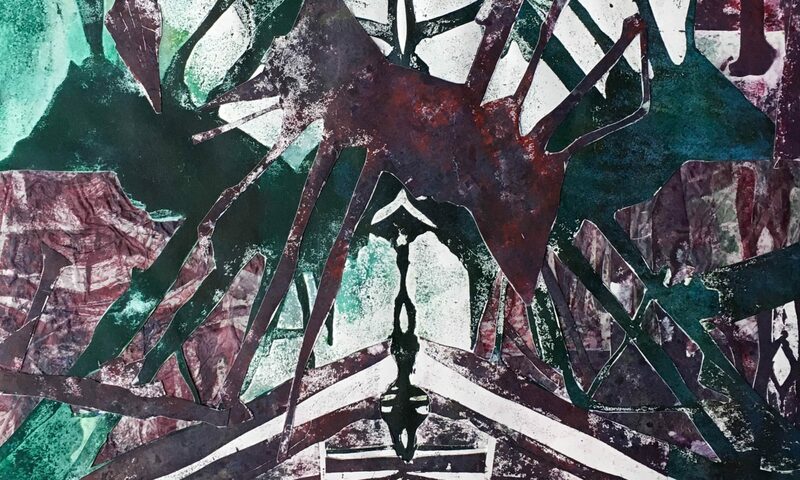 She mainly uses a combination of carborundum, drypoint and monoprint techniques. A mix of a binder (polyurethane varnish) and carborundum grit is applied onto the surface of a plate and sealed with the same varnish. The binder has to withstand a lot of working but should not be so thick as to hide the grit texture of the carborundum. To contrast the carborundum, drypoint is added to produce an incised line. The plate is then inked up using etching ink and copperplate oil with a brush or roller. Originally she worked in black and white. Now she also works in colour from memory and notes. Colour is built up by layering carborundum plates or more often overlaid though monoprint. Dry ink can be added as a third pass. Ink can be laid on thickly for more embossing. She can use the same base plate but with different seasons. Editions of 40. Or 10-15. She gets commissions where people ask for specific colours. The technique allows working directly in the landscape to paint on the carborundum and the drypoint plates, and large images can be produced. She prints on thick Somerset paper, printing to the edge of the paper to “leave the composition as unconstrained as the landscapes from which I seek inspiration”. She mounts with nonreflective glass.